When I wrote my review of David Lebovitz's "Ready for Dessert" I may have gone on just a little bit about the Banana Mocha Cake in his book. I may have mentioned how moist it was. How the combination of the bitter mocha frosting with the sweet banana sponge was a really tasty combination. 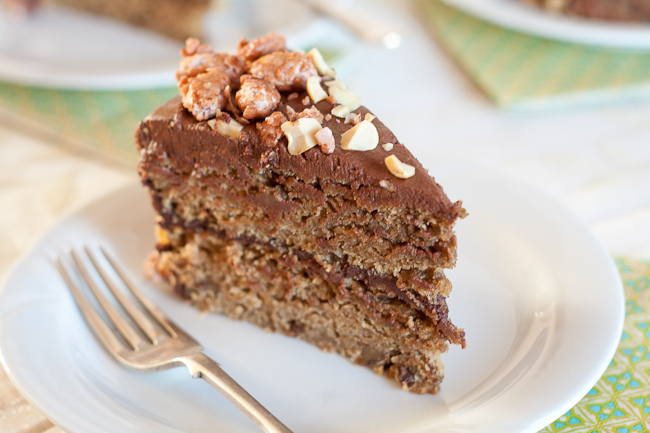 How the candied peanuts add a lovely crunch to the otherwise soft textures of the cake. I may have said quite a bit about it. That's why I'm posting the recipe. The first time I made this cake was while on holiday in South Africa. It was made for my aunt-in-law's birthday and it went down a treat. Everyone was raving about it. Although moist, it was also light and fluffy. The frosting a nice gooey chocolatey covering. Unfortunately second (actually third) time round I didn't get quite the same results and I'm almost wondering if my baking mojo's a little off. But, I've had to look at this practically. Use up those over-ripe bananas! When I baked this in SA I was at high altitude, so I did what I thought was suitable adjustments and was happy with the results. Also being in SA, the only flour available was bread or cake flour. Bread flour was not an option so I used the cake flour instead. A combination of the high altitude and weaker flour is probably why it was so gorgeously fluffy and light. My first attempt baking it back at home in Dublin didn't give me quite the same results. I ended up with batter that rose but then shrunk back down and ended up more like dense banana bread than cake. The obsessed baker that I am decided this wasn't good enough for you so I decided to bake it again. I even threw out my baking powder just in case. So with new baking powder and making sure everything was measured just so, mixed just so and instructions followed to the letter I tried again. Also, I checked the progress of the cake while baking and found it was baked in 30mins rather than 40. So with all of this I did have much better results. Another difference from the first time I made this cake was the frosting, while it's supposed to be finger licking gooey, this time round it didn't seem to like our cold weather. For various reasons we haven't put our heating on yet and the butter and chocolate mixture set up, and instead of that lovely soft ganache-like frosting, it was too firm. Darn you weather! The only thing I did manage to make better was the candied peanuts. In fact, those deserve a posting of their own. Compared to my first ravings about this cake you'd think I've now gone completely the other way in my opinion, but I haven't, it was and it still is an absolutely delicious cake, it was just different to the first time I baked it. I hit a bad baking patch, bound to happen from time to time, but I promise, this is a tasty cake! Recipe adapted from David Lebovitz's "Ready for Dessert"
Posted on November 29, 2011 by Mandy Mortimer and filed under Baked, Sweet and tagged Banana Banana Mocha Cake Chocolate Coffee David Lebovitz Peanuts Pecans Walnuts.